Almost anybody going through family law litigation, like a divorce or custody case, wants a quick resolution. In seeking this quick resolution, they want an amicable result. They want to spend the least amount of attorneys’ fees as possible. They want a result that is fair. And they want to move be able to move on with their life. This is easy to understand and a worthy goal. The hardship of enduring contested litigation is not easy. It is not easy from an emotional standpoint. It is also not easy from a financial standpoint. Why would anybody want to prolong it? (1) Why does it have to take so long? (2) Why do the costs have to be so high? (3) Why can’t the attorneys just end the case? (4) Why can’t the case just settle (when this is what we both want)? (5) Why can’t the judge just bang down the gavel and end it? Having said all of this is, the reason some cases don’t end quick is as simple as this: Reasonableness is in the eye of the beholder in family law. What is reasonable to the wife in a divorce might be entirely unreasonable to the husband. What the husband views as fair, the wife does not. She might have an entirely different view of how the case should resolve through a settlement. After all, if the parties saw eye-to-eye on issues, they might not be getting divorced in the first place, right? Take these examples: Parties might agree on eighty or ninety-percent of the issues in a divorce case. But they might not agree on the other ten or twenty-percent. For example, the parties might agree on custody, but they might not agree on spousal support. They might agree on property division, but they might be unable to reach an agreement on child support. They might agree on the general terms of a custody agreement, but they might get hung up on issues like summer visitation, who gets to claim the kids on taxes, how and where exchanges will take place, whether private school will get paid, etc. They might agree that spousal support should be paid, but they might get hung up on the amount or the duration. Any single issue where there is disagreement is what can hang up a case. To settle, parties truly need to agree on one-hundred percent of everything. And in saying this, both parties may view their own position as reasonable and the position of their soon to be ex as unreasonable. This is exactly why a family law case can be tough to resolve. It’s because what is reasonable to one party might be entirely unreasonable to the other. This is true even when both parties may wish to settle. In other words, while both parties might want to resolve their family law case in a general sense, they often have opposite views on what is reasonable, what is fair and what is just. Unfortunately, when that happens, the only way to conclude the is for the parties to compromise or have the case tried. 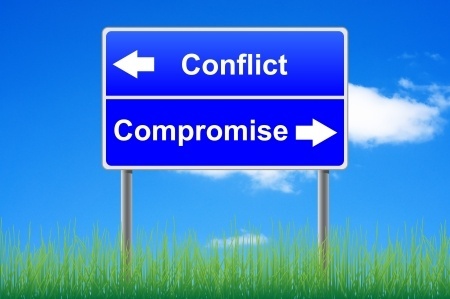 When compromise cannot happen, this is when a family case can end up on a backed-up docket. Being on a busy docket, awaiting a trial date, is exactly why some family law cases can take months, or maybe more than a year to resolve, while others can end quickly when a settlement is reached. The reality is that, in many jurisdictions, there are just not enough judges to deal with the heavy flow of new family law cases in an expeditious manner. Divorce rates are high. Unmarried birth rates are high. Family law is a busy area of the law in this society. This is why anybody going through a family case is wise to remember what is worth fighting over and what is not. It is important to be practical. At Stange Law Firm, PC, we offer prospective confidential, half-hour consultation if you are looking for a St. Louis Divorce Attorney. You can call us at 314-963-4700 or visit us at our St. Louis Family Law Webpage to schedule an appointment.